Yesterday was International Dot Day, and this is the first year I had my students join the millions (6.6 million from 139 countries, in fact) people making circles and dots as a way to nurture a sense of creativity and imagination. 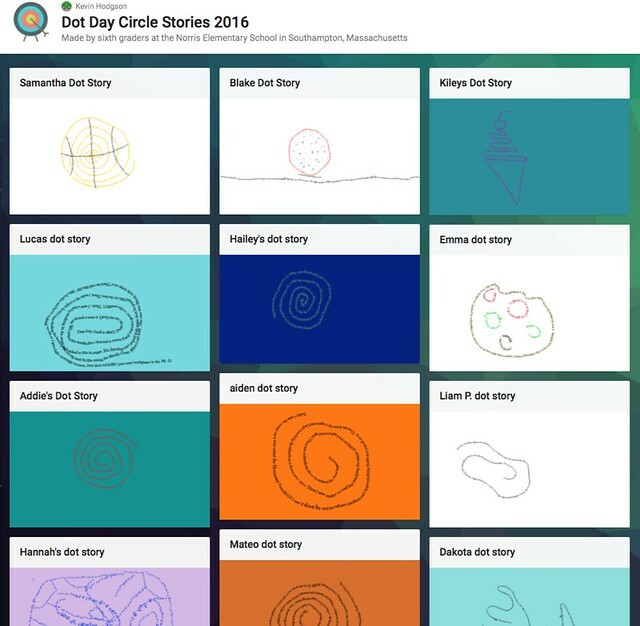 The Dot Day idea stems from a picture book by Peter Reynolds, called The Dot. We connected with Peter and his brother, Paul, last school year, and we hope to do so again this year. 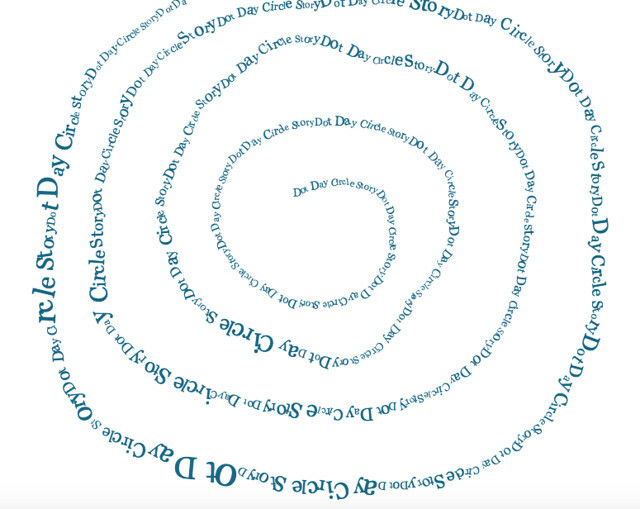 I decided to have my students write short one-paragraph stories on a circular theme — the story could have circular objects or have some other element of a circle — and then we used Visual Poetry to “draw with the words as ink.” That concept really intrigued them and blew them away. Finally, I had them upload their visual stories to a collaborative Padlet site, which has become this very cool digital wall of circle stories. Watching them write, and then watching them paint, and then watching them navigate the download/upload instructions has given me a lot of insight into them as learners already. They were fully engaged in this, partially because they knew their work (which we were tweeting out during the day from our classroom Twitter account) was part of a global conversation about creativity. Their stories were in the mix. That’s one element of Connected Learning that we teachers explore during the summer via CLMOOC — that idea of reaching out beyond the walls of your school, into the World at large — and I hope it is just a taste of things to come this year for us. Certainly, we will be doing something again around National Day on Writing and other ventures. Meanwhile, Dot Day also took place over at the DS106 Daily Create site, with Dots as the prompt. There were 31 responses. I loved seeing my DS106 friends doing all sorts of strange things with dots, and more than that, I loved extending the connected element from the Global Community to my classroom to DS106 and beyond. All sorts of strands come together at times. This entry was posted in CLMOOC, my classroom and tagged dotday, dotday2016. Bookmark the permalink. I’m planning to do Dot Day activities in my classes next week so thanks for this geat idea.